Cleaning up trench in garden W of front door step. A sunny day for our 4 volunteers, some nice finds, ‘aerial’ photographs of the site, and a little closer to finding the Latham family’s well. 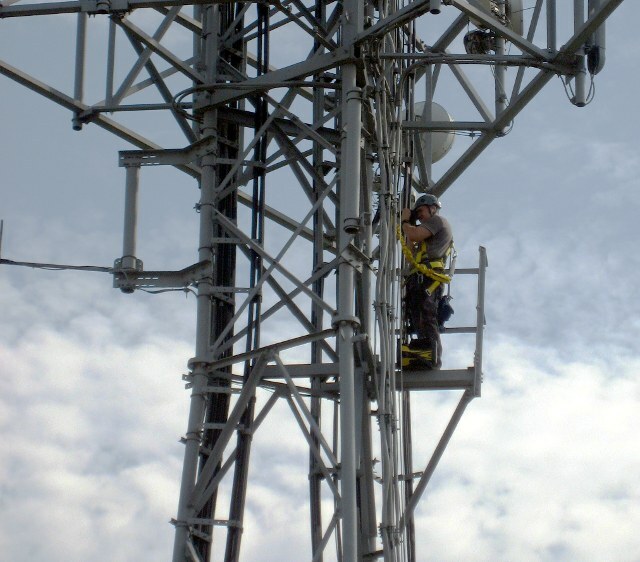 Engineer taking photos from aerial on Newmarket Hill. 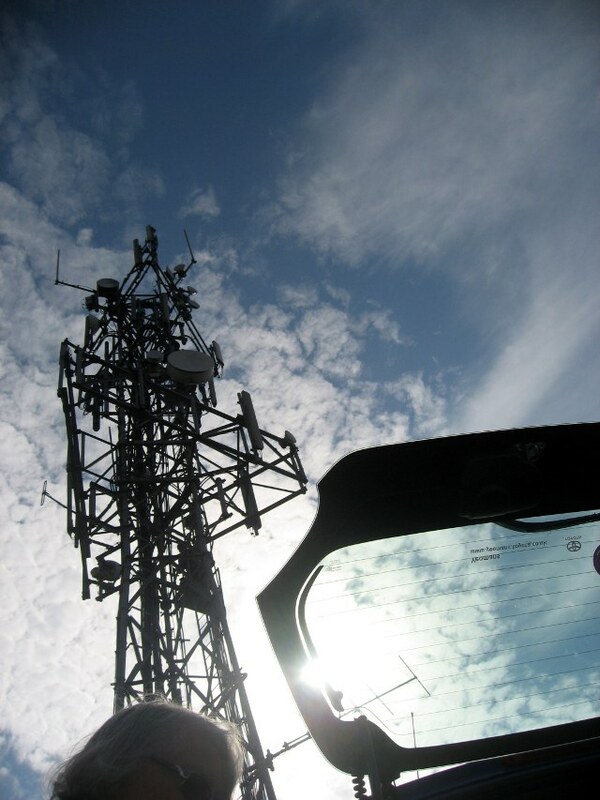 On arrival we met people working on the tall TV/mobile/emergency services communications aerial which dominates the top of the hill a little over a hundred metres from our site. 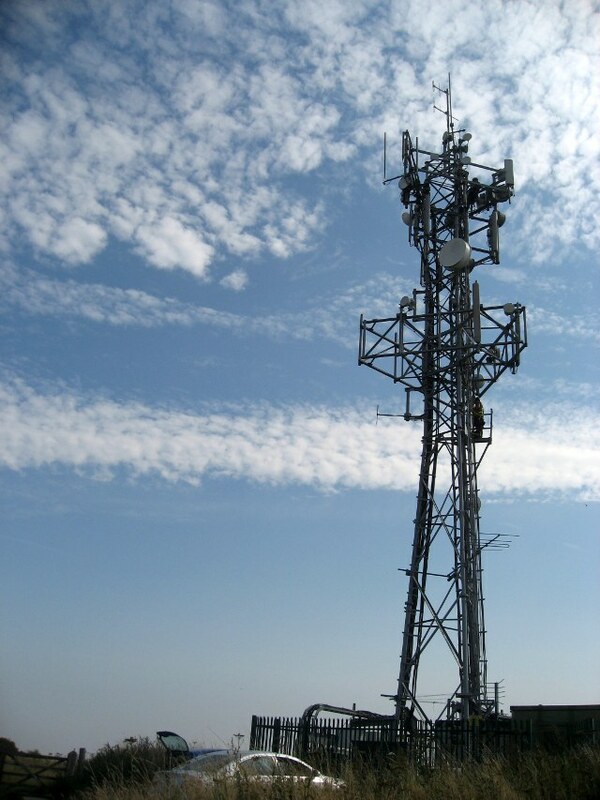 They very kindly took photos from about 2/3 of the way up; and the view was stunning. It very much helped put the site into its landscape context. View from NE to SE over the site from 1/2 way up aerial. 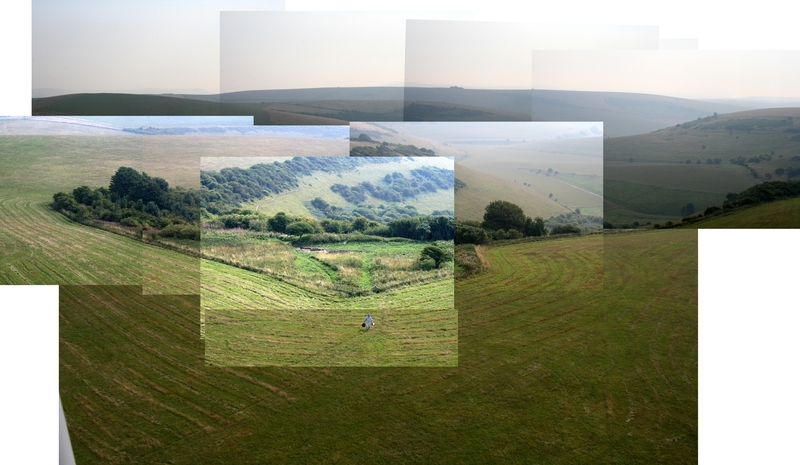 The photos taken, and compiled into a montage (if you click on the image above you can see a high-resolution copy), show how the site is beautifully situated in a hollow, right above the top end of a steep-sided valley. Only partially shown is that it is situated just below the ridges of the hills to its west and north, and further protected by other nearby hills both to the south and the east. It was only open to the south-east, with views across to Seaford Head and Cuckmere Haven, though these were hidden by haze at the time of our photos. Unfortunately, because of the slope of the land, the height of the vegetation, and that the older parts of the site are being recolonized by encroaching brambles and creeping thistles, it is hard to make out much of the dig site itself. Garden W of front door, S of toilet. The relatively small garden area – bounded by the front of the house, the garden/farmyard wall and the edging stones to the path between the front door and the toilet – was further cleaned up. 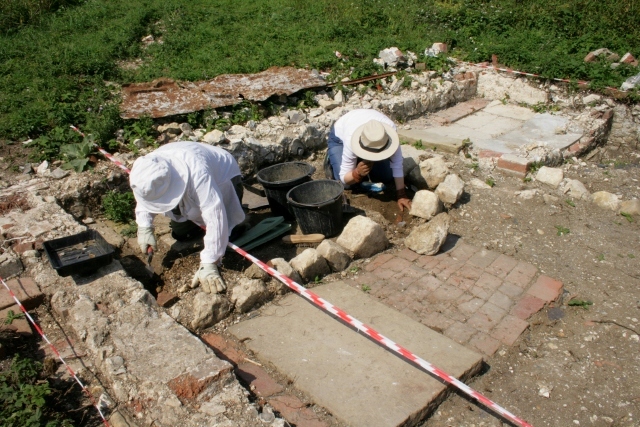 This was a location where a lot of rubbish had been deposited, and finds were plentiful. 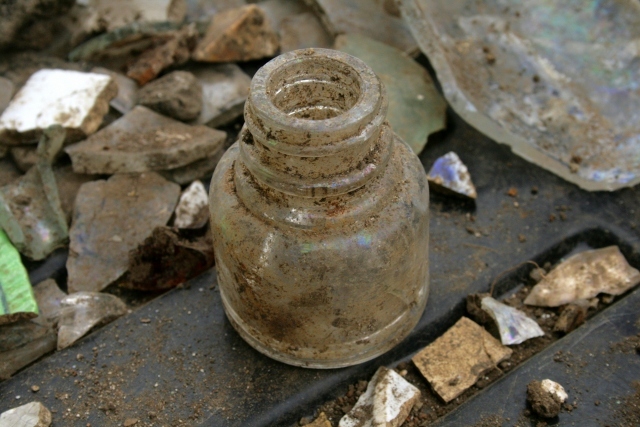 The best of these was a complete glass pot – in just 2 pieces – probably an ink bottle. 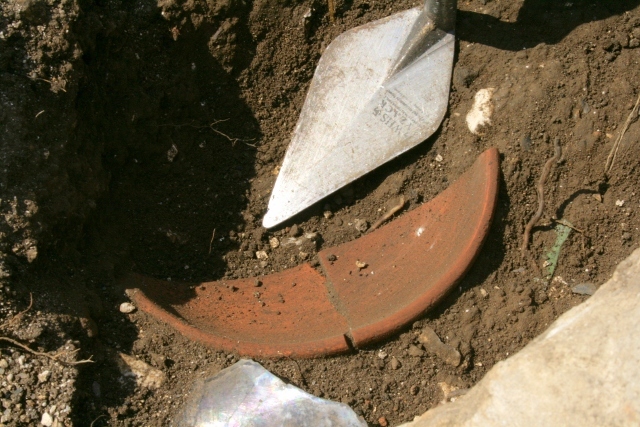 and half of an unglazed shallow terracotta bowl. Rainbow patina on old glass bottle shard. 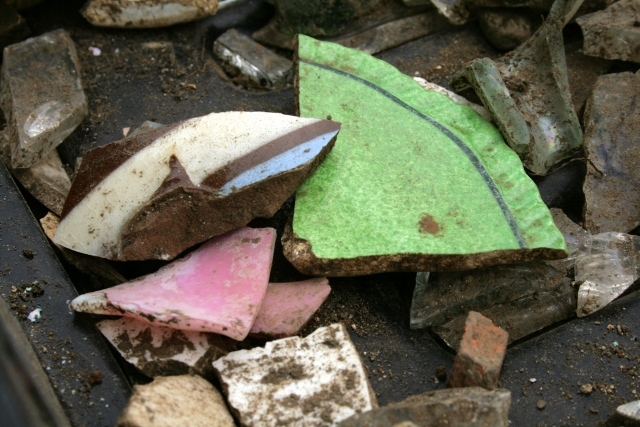 Many of our glass bottle shards looked old though none of the older shards had names. 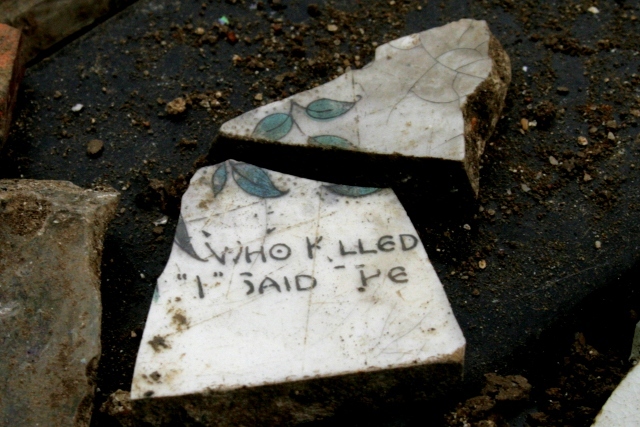 A first for the dig was a screw threaded rubber bottle stopper with the words ‘[? ]NION’ and ‘BRIGHTON’. 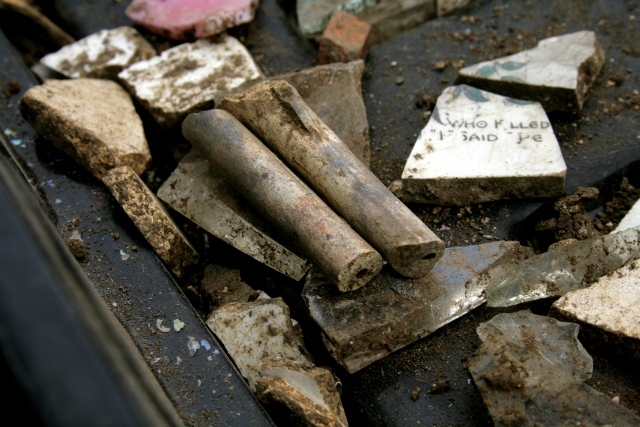 Two undecorated clay pipe stems were also found. 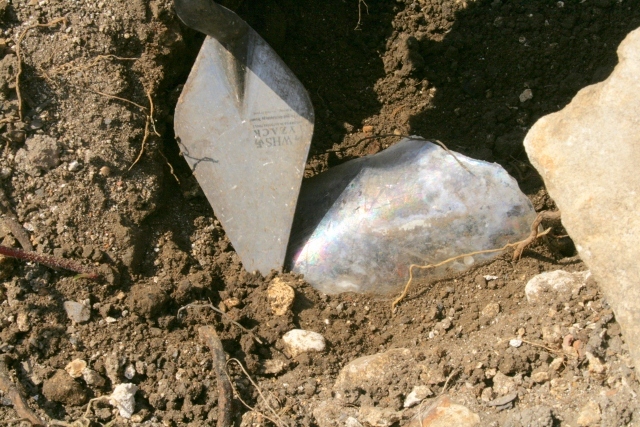 This area of garden soil under the demolition rubble showed no clear horizon, with small quantities of building rubble turning up below the original ground level, which proved a challenge to our diggers when distinguishing between the two contexts of the demolition fill, and the garden soil fill below it. 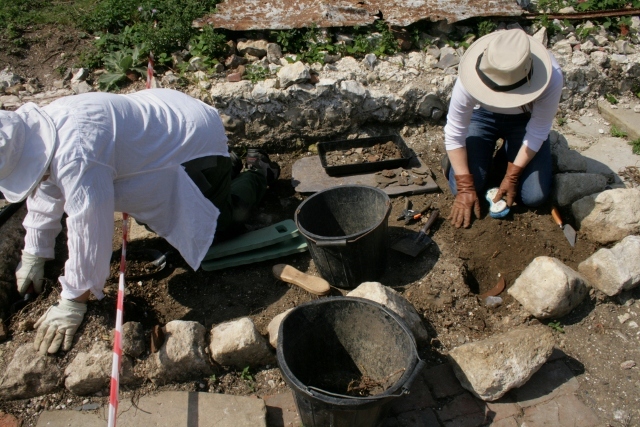 The quantity (and quality) of finds in this area inevitably slowed down progress on our other dig target – the location of the Latham’s (alleged) well. 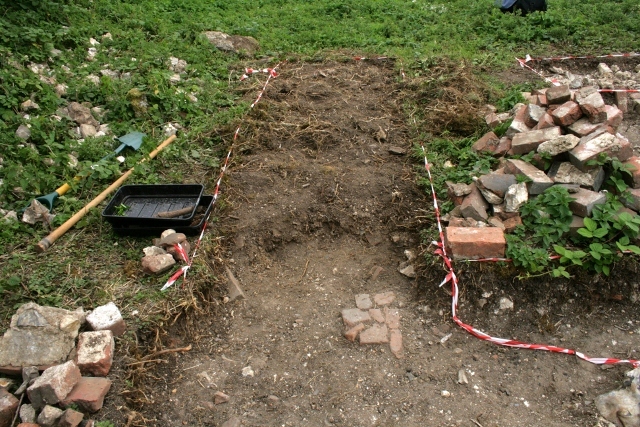 Finds from this area were few, but included another possible stirrup pump. Also nice was our 2nd screw threaded rubber bottle stopper – this time from a Gaymers cider bottle. ive found many screw threaded rubber bottle stoppers some with gaymers cyder 1840 embossed on top along with hundreads of other artefacts on the thames foreshore at low tides.